Inground pool pumps are commonly reversible in voltage, with the exception of pumps 2hp or greater, which require 220V. Reversible means that the pump motor can accept either 110V or 220V. These motors will come ready to accept 220V if you want to switch it to 110V, follow the label diagram to reverse the voltage. 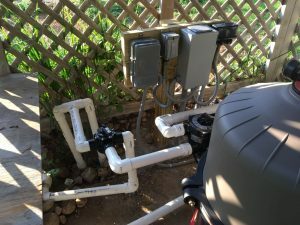 Aboveground pool pumps are often 115V only, wired with a power cord, and plugged into a GFCI outlet. 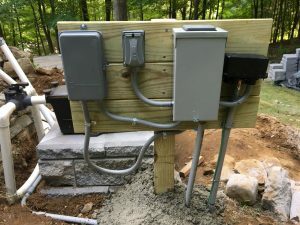 When wiring a single speed pool pump motor of either voltage, 3 wires bring power from the breaker, timer or switch, and connect to the terminal board of the motor. The green ground wire connects to the green ground screw, and the other two power leads will connect to the two power terminals marked (usually) L1 and L2. It doesn’t matter which wire goes to which terminal. Hook the wire with needle nose pliers and slip it under the brass screw, and tighten down firmly. The ’hook’ of the wire should be facing to the right so that when you tighten down the screw clockwise, it helps pull the wire into the screw. If the hook is facing left (like a question mark), it will tend to come loose as you tighten down the screw. Female spade connectors can also be used; slipped over the brass terminals adjacent to the screw. Wiring two-speed pumps is a little different – there are 4 wires instead of 3. The fourth wire is the low-speed wire. To convert to a dual speed pump, you’ll need to add the fourth wire and switch out the time clock to a two-speed clock, or the PE153 digital time clock, which can accept the fourth wire. Wiring a variable speed pump is simpler than a two-speed pump, with the standard 3-wire system used. 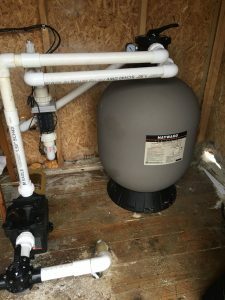 When installing a VS pool pump, a time clock is not usually needed, since the pump itself can be programmed for run times, and thus replaces the time clock. 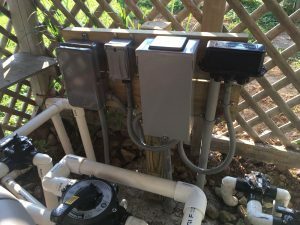 Booster pumps for pool cleaners or solar systems can be operated with 110V or 220V, and are usually connected to a separate timeclock, powered with a dedicated 15 or 20 amp breaker. The wiring of the motor is identical to the wiring for the main pool pump. 220V is slightly more efficient and a better choice for either pump and hard wiring it directly from a breaker and time clock is the preferred method. Gas Heaters can be wired with either 110V or 220V, but they don’t need their own timeclock or even their own breaker. 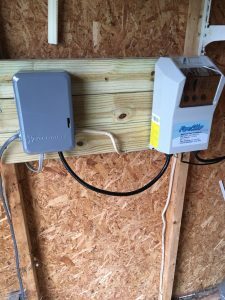 They can be – but they are usually powered by tapping off of the pool pump time clock, bringing in two power wires and a ground wire. Follow the instructions on the inside of the heater or consult the owner’s manual for instructions specific to your heater model. Salt Chlorinators can be purchased with an attached plug – powered by a GFCI outlet that is properly grounded. Larger inground salt systems will require hard wiring from the timeclock, tapping power in the manner described for a gas pool heater. 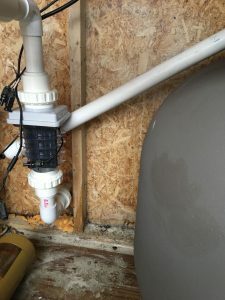 Connecting a salt system to the pool pump timeclock is the preferred method so that the salt cell is not powered up while the pool pump is off. Pool Lights are hazardous, even low voltage 12V pool lights can be wired incorrectly and create an electrocution hazard. 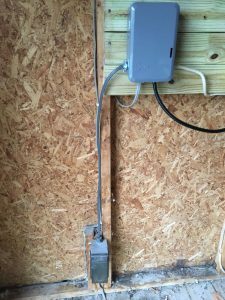 The light cord runs from the wall light niche and connects to the power from the sub-panel inside of a junction box. This box must be a certain distance from the pool, and a certain distance above the waterline. Pool lights must also be bonded, and the breaker must be a GFCI breaker. If your pool light wiring looks sketchy, or if you are replacing an entire light fixture, please hire an electrician and avoid a possible tragedy. Older pools, built before 1975, may not have wiring that conforms to NEC Article 680. Using pool pump timer clocks makes good sense. 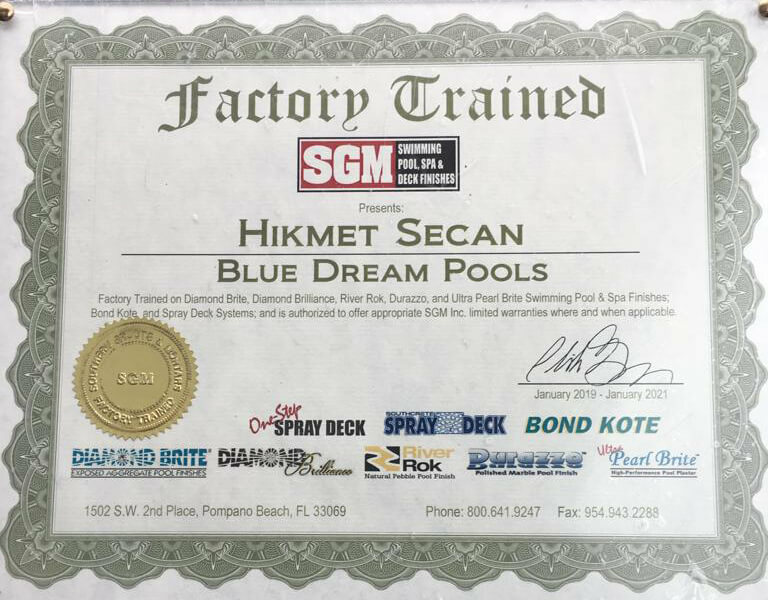 Most pools have efficiency in sanitizing, filtering and circulation such that they don’t need to operate 24 hours a day. Pools are designed to “turnover” the water in the pool in eight hours’ time. We commonly set time clocks to operate 10 – 14 hours per day, depending on the efficiency of the system, amount of debris and pool use. As the water warms in pool season, you’ll need to run the pump longer each day. More than one set of time clock trippers allows you to run the pump in the morning, and then late in the afternoon, to avoid peak usage times. 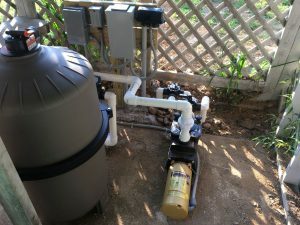 I commonly advise pool owners to operate the filter system during the day, so that processes are active while the sun is beating down and the pool is most likely to be in use. Setting a time clock is simple. Inside the box, you’ll see a 24-hour dial. There are two “timer dogs” on the dial. One turns the timer switch on, allowing power to go to the filter pump, and the other turns the switch off, stopping power from going past the timer to the filter pump. Loosening the small screw on the timer dog allows you to slide the dog at any time on the dial. Reposition and retighten. Timer Clock not switching On or Off? Is the breaker on? The clock and the switch will only operate with the breaker on. There may also be loose wiring connections. (Check this only with the breaker off). Intermatic timers have a visual inspection window to look at the timer mechanism and see if the gears are turning. If they are not turning, the mechanism may need to be replaced. This means that the clock motor is fried. If they are turning, check that the dial is not bent, which would prevent the trippers from contacting the switch as they come around. If the clock is close to shutting off, the tripper may prevent you from manually turning it off by flipping the tab switch. Pull the dial out and turn the tripper past the switch. Remember to reset the time in this manner later. Small animals or insects seem to be drawn to timer boxes and breaker boxes out in the outdoors. It may be the warmth, or the vibrations, not sure. If you have enough of them in there, they’ll start to gum up the works, and short out the contacts. If your timeclock or sub-panel is infested, a can of Raid™ should do the trick. As for lizards, not much of a problem, although I did find one stuck in the gears of a time clock mechanism. First off, don’t mess around with the wires while the power is on – shut off ALL of the breakers, and the time clock. If you have to leave the equipment pad for even a minute, tape shut the breaker, or padlock the breaker box, to prevent someone else from turning it back on during your absence. Secondly, hire a professional electrician for jobs that are beyond your capability or comfort level. If you are like me, you may be a little too comfortable, and feel yourself to be overly capable. Don’t risk your life – electricity can kill! Improperly wired pool pumps and pool lights, in particular, have claimed many lives. Third, equipment pads are commonly wet and thus hazardous. Be aware of water pooling around the equipment, and water that can cause equipment problems or create hazards. Never handle electricity while standing in wet or damp areas. Bonding is a bare copper wire that connects the metal in the pool (rebar, ladder sockets, pool lights, dive stand, etc) to the electrical equipment on the equipment pad. This wire should be continuous (unbroken), and when adding additional equipment, the bonding wire should be pigtailed from a nearby equipment, and placed into the loop. Grounding, by contrast,t is something completely different, although similar. The purpose of both is to capture stray voltage and keep it away from you, but the grounding wire runs in the circuit. Every piece of electrical equipment will have a ground screw, and all of the grounds will terminate to a grounding rod placed in the ground. Codes regarding bonding and grounding vary by locality, be sure to check with your local building inspector on requirements for your pool or spa. For information on National Electrical Codes related to pools and spas, see Article 680 of the NEC.